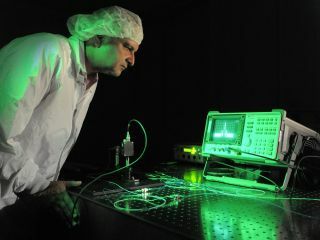 Goddard physicist Babak Saif is part of a team from Stanford University and AOSense, Inc., a Sunnyvale, Calif.-based company, that has received NASA funding to use atom optics to detect theoretically predicted gravitational waves. Albert Einstein predicted the existence of gravitational waves that ripple outward from moving celestial objects such as stars or black holes — but such waves are so weak by the time they reach Earth that the planet quivers by less than an atom's width in response. NASA wants to harness the spooky quantum behavior of atoms to help detect the gravitational waves. The U.S. space agency has funded the possible solution, called atom interferometry, so that it might someday enable a mission consisting of three identical spacecraft flying in a triangle formation between 310 miles (500 kilometers) and 3,107 miles (5,000 kilometers). If a gravitational wave swept through the area, the spacecraft interferometers would sense the tiny disturbances. "The NASA funding is basically for a preliminary design study for what a gravitational wave detector would look like," said Mark Kasevich, a physicist at Stanford University. The technology would enable scientists to detect gravitational waves related to events such as a black hole or two stars merging in a distant star system. It could also lead to more sensitive sensors for steering U.S. military submarines or aircraft — Kasevich's Stanford lab has been working on gyroscopes, gravimeters, accelerometers and gravity gradiometers for the U.S. Department of Defense. But for NASA, a gravitational wave detector is "probably a decade away," Kasevich told TechNewsDaily. An actual space mission would probably take even longer to launch. The atomic interferometry funded by NASA's Innovative Advanced Concepts program takes advantage of quantum mechanics, the physics theory that describes how matter behaves at the tiniest scales. That effort is led by researchers at NASA's Goddard Space Flight Center in Greenbelt, Md. ; Stanford University in California; and AOSense Inc., in Sunnyvale, Calif. Researchers would first fire a laser to slow and cool the atoms down to a frigid temperature near absolute zero (minus 273.15 degrees Celsius), so that the atoms behave like waves rather than particles. Then they would fire more laser pulses that put the atoms into a "superposition of states," which allows them to exist in multiple states simultaneously. The superposition means a single atom can split into different states that exist independently and go flying off on different trajectories like separate particles, before they recombine at a detector. If an atom's path is altered even a bit by a passing gravitational wave, the atom interferometer can detect the difference. NASA's funding does not cover the full spacecraft mission just yet. First, the researchers plan to test the atomic interferometer at a 33-foot drop tower in the basement of a Stanford University physics laboratory — firing lasers at a cloud of falling rubidium atoms to cool them and then put them into their "spooky" quantum states. Successful testing could establish the foundation for making the space version of the technology.